Three progressive women lead Tuesday’s race to succeed Democratic Rep. Keith Ellison – the first Muslim elected to Congress – in the primary for Minnesota’s 5th Congressional District, and each has achieved a “first” of her own. 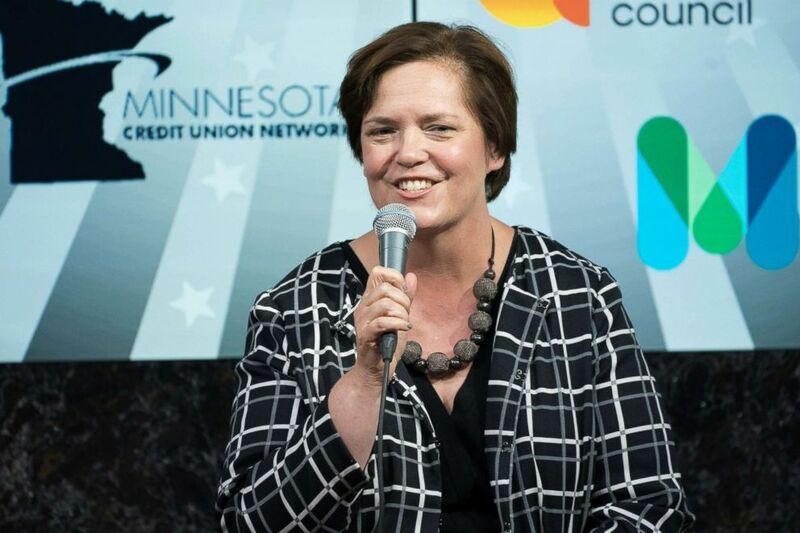 In the crowded Democratic primary, state senator Patricia Torres Ray, the first Latina in the Minnesota Senate, is competing against former Minnesota House representative Margaret Anderson Kelliher, the second woman to serve as Minnesota House Speaker and the first woman to receive a major party’s endorsement for governor in Minnesota. And, on the heels of Rashida Tlaib’s historic win in Michigan, another Muslim American woman, freshman state representative Ilhan Omar, hopes to score a victory, after making history herself when she was elected to the state House in 2016, becoming the nation’s first Somali-American legislator. The three female frontrunners are also facing Somali-American activist Jamal Abdulahi and former Republican Frank Drake, who are viewed as long shots. Minnesota Representative Ilhan Omar smiles while speaking during the Democratic Farmer Labor (DFL) Party endorsement convention in Minneapolis, June 17, 2018. The frontrunners have split endorsements, though Omar has garnered the support of progressive backers including Justice Democrats, MoveOn, and Bernie Sanders outgrowth Our Revolution – the same grassroots social and economic justice organizations that backed Alexandria Ocasio-Cortez, who has herself campaigned for Omar. The candidates are all progressive women considered likely to vote along similar lines in office – all three support Medicare for All, #AbolishICE, and leftwing economic proposals – and have consequently struggled to differentiate themselves, relying on experience and identity as well as political ideology to define their campaigns. 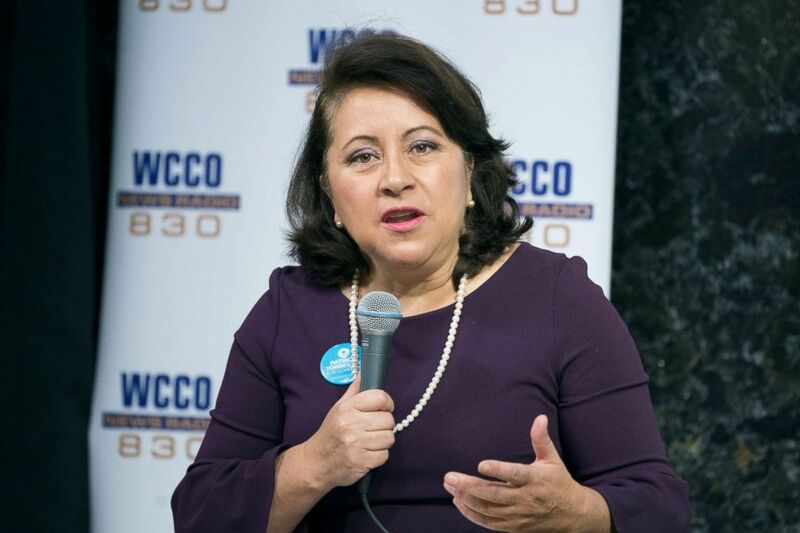 Patricia Torres-Ray speaks at debate, Aug. 2, 2018, in Minneapolis, Minn.
“I bring a blend of both legislative experience, and I’m an immigrant so my experience as an immigrant, a person of color and as a woman,” Torres Ray told ABC News. She said her experience as an immigrant who arrived here “not speaking a word of English” is the quintessential story of the American dream, and informs her policy work, which focuses on low-income Americans and people of color. “I think that’s an important perspective to bring because right now, not everybody has a voice,” she said. Kelliher told ABC News that her accomplishments as a state representative should give voters confidence that she would be a vocal opponent to the GOP if elected to Congress. “It’s both experience and results – being able to stand up to someone like Tim Pawlenty, having a number of victories and holding an administration accountable – people really make the leap right to Donald Trump,” she said. Margaret Anderson-Kelliher speaks during a debate, Aug. 2, 2018, in Minneapolis, Minn.
Omar was not available for an interview with ABC News. 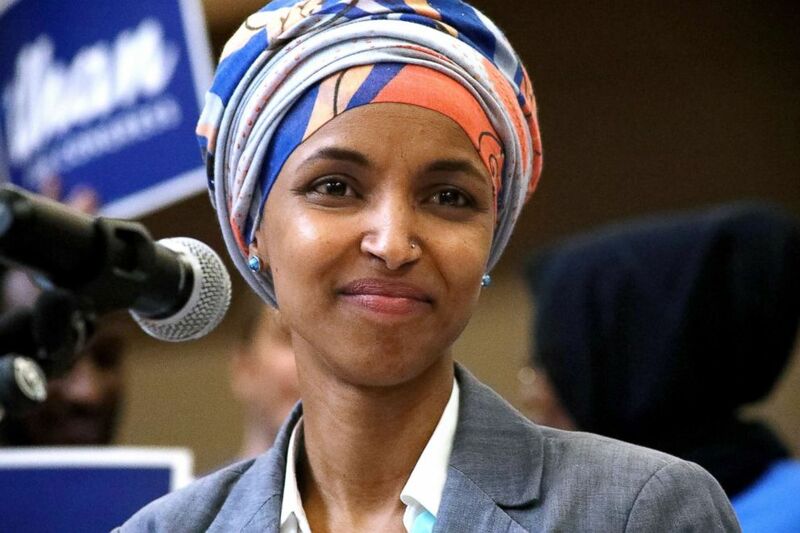 A freshman state representative, Omar has been criticized for her lack of experience, but stresses her experience as a community leader in multiple roles, including as an activist in the Minnesota Democratic–Farmer–Labor Party, prior to her time as a representative. Additionally, she has emphasized her identity as a Somali-American, Muslim refugee – as well as her policy planks – as setting her apart from her progressive competitors, joining a number of candidates who, often in races facing ideologically similar opponents, argue that legislators should look like the districts they represent. The claim parallels an argument by Ayanna Pressley earlier this summer in an interview with ABC’s Rick Klein and MaryAlice Parks on Powerhouse Politics. “People often say that, other than my age, race and gender, we are the same, which, on its face, I’m perplexed by that statement. Those are three major differences, all of which have formidably shaped my worldview,” Pressley said. Still, while she stresses that representation and diversity are important, Omar has made her push for economic justice the center of her campaign. Abdulahi has also struggled to differentiate himself in a race crowded with progressive candidates – the Somali-American activist faces a formidable challenge, particularly in Omar, but told ABC News he considers himself a “problem solver” facing several career politicians, and stressed his work as an engineer in the private sector, along his social activism, as setting him apart. “What voters are asking for is not only platitudes wrapped around progressive personhood, but a detailed policy, and experience,” Abdulahi told ABC News.